Garlic Liquid Extract, 1 fl oz / 30 ml each (Nature's Wonderland) - Penn Herb Co. Ltd.
Garlic is a source of other naturally occurring compounds including fiber and amino acids. Get the whole herb benefits of this super kitchen spice in a fast-acting liquid extract. Get the super spice for your kitchen and herbal medicine cabinet! 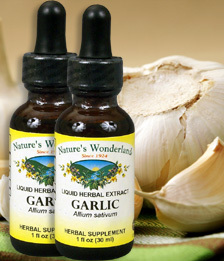 AMOUNT PER SERVING (333 mg/ml or 30 drops): Certified Organic Garlic Bulb (Allium sativum). OTHER INGREDIENTS: Grain Alcohol (40-50% by volume), Deionized Water. Supports cardiovascular health; supports healthy lipid/triglyceride levels; supports arterial health; supports healthy circulation; reinforces immune defenses. Provides antioxidant protection; supports healthy lymphatic function; supports upper respiratory health. 15-40 drops in juice or water, 2-3 times daily or as needed. DO NOT TAKE DURING PREGNANCY OR WHILE NURSING. Shake well before using.